Beautiful Crime are opening their BCC (Beautiful Crime Concept) store at Lulu Guinness in Floral Street on 15th November, to run until after Christmas. 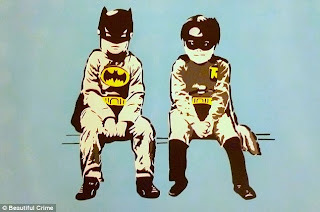 There will be lots of limited edition prints from artists like Tracey Emin and Banksy, but also by newer artists. I'm told (Daily Mail article below) what prices will start at £30 for prints. "She's famed for being one of London's most creative accessories designers and now Lulu Guinness is to take her passion for art one step further with the launch of a pop up concept store at her London shop. The store, named BCC and launched in collaboration with art company Beautiful Crime, will sell limited edition prints of pieces created by some of the UK's top modern artists, including elusive graffiti specialist, Banksy. Other works by Tracey Emin, Charming Baker and James Reid are also available, and there's even an unusual portrait of the Duchess of Cambridge courtesy of rising star Sonia Hensler. Despite the three-figure price tags charged for one of Guinness' designs - fans of which include the Duchess of Cornwall and model Elizabeth Jagger - prices for the limited edition prints start at just £30. 'My brand is heavily influenced by art so I am thrilled to be able to support Beautiful Crime, which is innovative in its approach,' revealed the designer. Guinness has a history of artistic collaborations, most recently one that saw artists fire paint bullets travelling at 60mph at the British designer's luxury handbags. 'Choosing to open a pop up concept store with the support of Lulu Guinness made perfect sense for us,' added Beautiful Crime creative director Ruthie Holloway, who masterminded the Lulu Guinness Paint Project. 'Her approach to creativity and innovation is very much in line with Beautiful Crime's approach to art. The gallery, which will also sell pieces by emerging artists such as urban artist, Hannah Adamaszek and illustrator Jacques Turner of Vyryn who puts his illustrations onto T-shirts, opens on the 15th November and will remain in place until the 29th December."